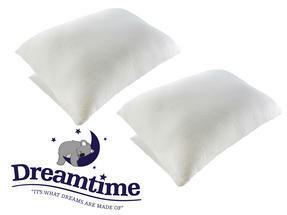 Sink into dreamworld with these two luxurious Dreamtime pillows which offer improved support for your spine and back, helping to reduce aches and pains. The specially designed material moulds around your head, neck and shoulders to support your sleeping position and provide optimum levels of comfort throughout the night. These pillows are a bedtime necessity if you find yourself tossing and turning in the night, struggling to get comfortable, and are the perfect accompaniments to a wonderful sleep. 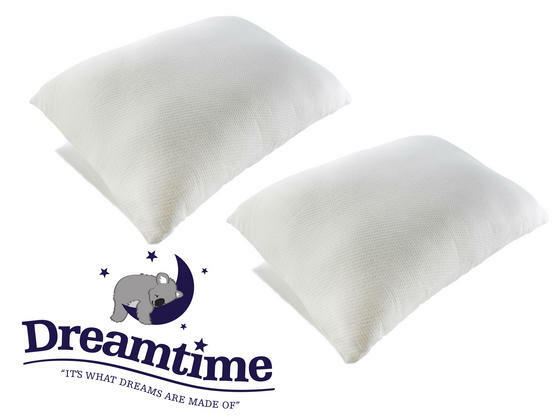 A set of two, these Dreamtime memory foam pillows will support your sleeping position so you can enjoy a peaceful night and wake up feeling rested. Perfect for any sleeping position, these pillows are full of fluffy fibres encased in a layer of memory foam for comfortable support. Measuring approximately 70 x 40 cm, the standard sized pillows will fit most pillowcases so you can use them with your existing bedding. They are made from a 0.8 cm memory foam shell with hollow fibre fillings and luxurious 60% polyester, 40% viscose removable covers. Softly snug and luxurious, these gorgeous pillows will provide additional support and comfort throughout the night for your best ever sleep.